Tigres face River Plate in the two-legged Libertadores Cup final. River Plate players celebrate reaching the Libertadores Cup final. Cruz Azul fell at the final hurdle in 2001, as did Chivas Guadalajara nine years later. Now a Mexican club has another opportunity to take the Copa Libertadores out of South America. Over the next two Wednesdays tigres take on River Plate of Argentina in a home-and-away final, the first leg in the summer of the northern hemisphere, close to the frontier with the United States, and the second with Buenos Aries in the grip of the southern hemisphere winter. The finalists have already met each other in this year’s competition. They were in the same group, and both of their matches ended in a draw. But Tigres were the better side on both occasions. The two sides have since brought in re-enforcements – who played a key role in the enthralling semi finals. 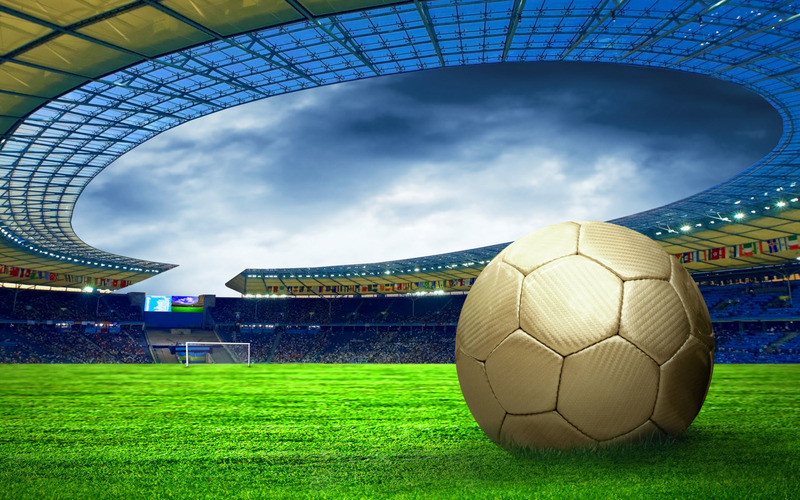 In the previous knock out rounds, little Guarani of Paraguay had eliminated giants Corinthians of Brazil and Racing of Argentina without conceding a single goal. So they had cause to resent the 7 week pause before the semi finals, during which the Copa America took place – especially because their outstanding defensive linchpin Julio Cesar Caceres picked up an injury and missed the first leg in Buenos Aries. Without the veteran organising the back three, Spanish coach Fernando Jubero’s side never found the confidence to reproduce the fluency they had so pleasingly and surprisingly displayed earlier in the competition. River Plate struck with a pair of second half goals, right back Gabriel Mercado firing home after a corner, and Uruguayan striker Rodrigo Mora scoring with an inspired chip. Guarani were back at full strength in Asuncion a week later, and when Fernando Fernandez rounded off a fine collective move with a left footed shot, there was a real possibility that the Paraguayan fairy tale might contain a few more chapters. The River defence was rocking. But coach Marcelo Gallardo chose the moment to unleash one of his new signings, Uruguayan attacking midfielder Tabare Viudez – and as the Paraguayans poured, forward, Viudez supplied the talent and the clarity on the counter attack that tipped the balance. He produced a long pass good enough to cut out the superb Caceres, and centre forward Lucas Alario, another re-enforcement, lobbed the keeper to seal River’s place in the final for the first time since 1996, when Gallardo was a promising youngster on the substitutes’ bench. 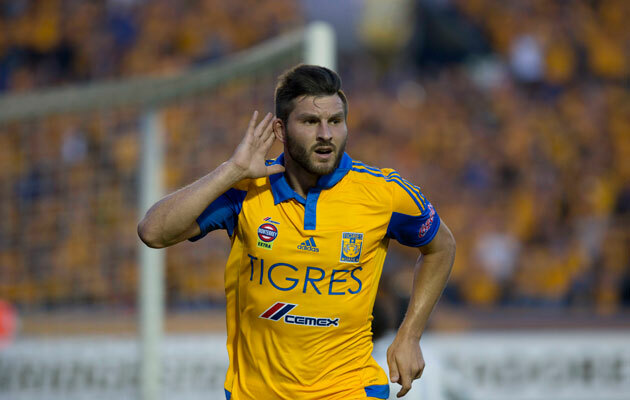 André-Pierre Gignac celebrates scoring for tigres against Internacional. Internacional had been in constant action in the Brazilian Championship. Tigre were playing their first competitive match since the end of May. 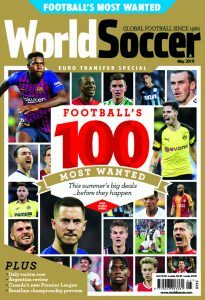 They had made a long journey down to the south of Brazil for the first leg, and they had new signings (the Mexican wingers Jurgen Damm and Javier Aquino and, intriguingly, French centre forward André-Pierre Gignac) to bed in. There was every danger, then, that Tigres would be seriously undercooked for the match in Porto Alegre – a view which seemed more than justified after just ten minutes. Inter charged forward. Andres D’Alessandro took advantage of a loose back pass to fire home, and then Valdivia, with the aid of a deflection, rounded off a fine move with a second. At this point the tie looked likely to be all over by half time. But Tigres played their way back into the game. Centre back Hugo Ayala headed a goal back, and until he was sent off just before the hour the Mexicans took control. Thereafter, they were happy to sit back and run down the clock, confident of overturning the deficit in front of their own fans. And the warning signs which had blinked in Porto Alegre were soon flashing on overtime in Nuevo Leon. And so it proved. The Internacional defence had no answer to the power and mobility of Gignac, to the darting runs of Aquino on the left and, especially, to the speed and precision of Damm down the right. He crossed for Gignac to put Tigres ahead on away goals, and then panicked tortured Inter left back Geferson into scoring an own goal. Aquino won a penalty, poorly struck by former Inter idol Rafael Sobis and saved by Alisson. But soon afterwards Inter were ripped apart once more, and Damm crossed for Uruguayan midfielder Egidio Arevalo Rios to score with a diving header. Inter, without being terrible, had been completely outclassed. But they did produce some unexpected late drama, Eduardo Sasha pulling back for Lisandro Lopez to guide home in the 89th minute. Another one would take Inter through on away goals. But it did not happen and would not have been deserved.